everything is on track for the May 5 launch of the United Launch Alliance Delta II rocket carrying the Missile Defense Agency Space Tracking and Surveillance System Advanced Technology Risk Reduction (STSS ATRR) payload on behalf of NASA. As a reminder, the launch window is 1:24-1:52 p.m. PDT. If we scrub a day, the launch window is the same on May 6. 1) An audio line for media to listen to the countdown will now be provided. You can call the KSC media circuit lines at 321-867-1220/1240 at approximately 2.5 hours prior to launch to listen in. There will not be a broadcast of the launch on TV or www. 2) The meet time for media launch day viewing is May 5, 12:30 p.m. PDT at the Vandenberg AFB front gate. Post launch media releases will be sent after the mission has concluded. Spacecraft separation occurs 58 minutes after launch. After launch day, any posibility for launch video? It looks like a 'run of the mill' Delta II to me. What is the wind limit for a Delta II? Too bad - 9 strap ons and a day launch. At night the 9 are spectacular compared to the recent 4 SRB versions. Might have missed the answer somewhere. Is this going to be broadcasted anywhere? Thanks for the updates Pad Rat! SFN reports that both sets of boosters separated nominally. Years ago SECO meant sustainer engine cut off..........what words are used for second stage cutoff in SECO? Sustainer Engine Cut Off would've only applied to Atlas. Thanks - i know it is in use today but I couldn't figure how it got into use with a separate stage. Are the burns for payload avoidance or for deorbit (if you can say)? Usually Delta II second stages stay in orbit, right? Thanks again, happy 48th anniversary! Thanks again to Pad Rat!! Vandenberg Air Force Base, Calif., (May 5, 2009) – A United Launch Alliance Delta II rocket, on behalf of the NASA Launch Services Program, successfully launched the Space Tracking and Surveillance System (STSS) Advanced Technology Risk Reduction (ATRR) mission for the United States Missile Defense Agency at 1:24 p.m., PDT today. The Missile Defense Agency's STSS Advanced Technology Risk Reduction satellite serves as a technology pathfinder for the STSS mission - a space-based sensor component of the layered Ballistic Missile Defense System. Blasting off from Space Launch Complex 2, the ULA Delta II 7920-10c configuration vehicle featured a ULA first stage booster powered by a Pratt & Whitney Rocketdyne RS-27A main engine and nine Alliant Techsystems strap-on solid rocket boosters. An Aerojet AJ10-118K engine powered the second stage. The payload was encased by a 10-foot-diameter composite payload fairing. ULA technicians, engineers, and management worked for more than two years to prepare the vehicle for the STSS ATRR mission. ULA’s next launch is the NASA Lunar Reconnaissance Orbiter mission set to launch June 2 aboard a ULA Atlas V rocket from Space Launch Complex-41 at Cape Canaveral AFS, Florida. 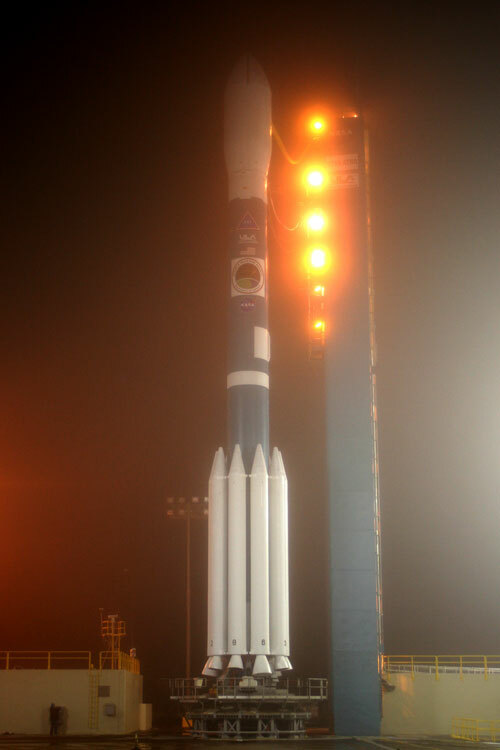 Formed in 2006, ULA combines the successful Atlas and Delta expendable launch vehicle programs offering cost-effective and reliable launch services to U.S. government customers, including the Department of Defense, NASA, the National Reconnaissance Office and other commercial organizations. Does anyone know what USA designation (if any) is being assigned to the satellite? 205 is the next one in sequence, but they don't always go in sequence, and technology satellites don't always receive them. A United Launch Alliance Delta II rocket blasts off from Space Launch Complex-2 launch pad at Vandenberg AFB, Calif., at 1:24 p.m. PDT. The Delta II successfully carried the Missile Defense Agency's Space Tracking and Surveillance System (STSS)Advanced Technology Risk Reduction(ATRR)payload into orbit. Photo by Carleton Bailie, United Launch Alliance. We'll miss these when they're gone.